Hey there! Do you love dogs?! Do you love adventure?! Do you love the outdoors?! Well then you are in the right spot because I am about to drop some knowledge on you. Today’s topic will be….. *cue the drumroll please*.....Camping!!!!! Now I know what you are thinking, “Gee, Dan, how hard can it be to go camping with my pup?”. Well to answer that, it is not all too hard, but there are definitely a few things that you’ll want to do to ensure that you and your furry friend have a more enjoyable time. So without further adieu, let’s get right down to it! Now if you have never gone camping yourself before, then you are without a doubt going to want to go on a few solo trips before bringing Fido with you. Other humans are welcome, but my advice is “No Dogs Allowed” until you have some camping experience under your belt. 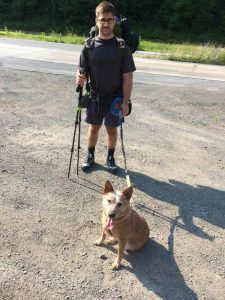 You have to learn how to be comfortable and at ease in the outdoors before you can think about introducing a canine camping companion to the mix. Another option when learning how to become a pro is to take a class or two. Contact your local outdoor store and see if they offer any classes. Now that we have the skills developed, let’s go ahead and put them to use. The next step on your quest to developing a healthy friendship with Mother Nature is to find where to pitch your tent. 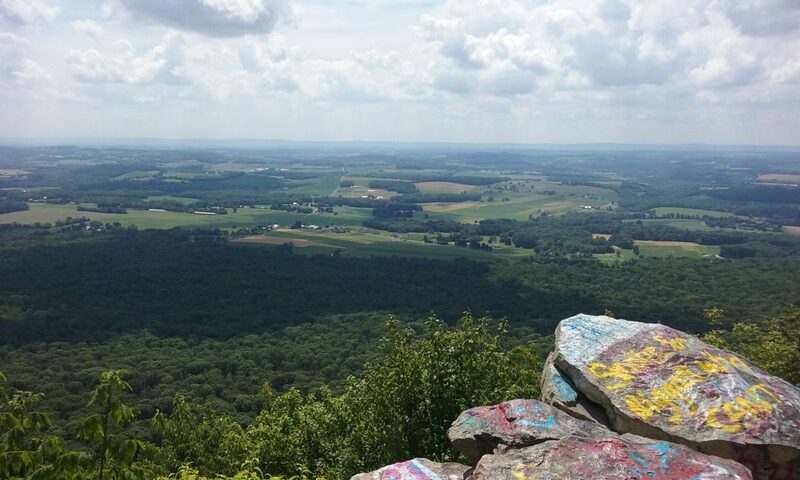 There are plenty of state parks to choose from in the state of Pennsylvania. Now I haven’t been to all of them, but I will say that all of the ones that I have been to have been pretty nice so far. Go through the list and pick one to your fancy. Then go on and give them a call and see what sort of camping accommodations they have. Make sure that the campsite is accessible by car and most importantly make sure that it is dog-friendly. Going to a campsite that isn’t accessible by car is a whole other ball game. Remind me to talk about it some other time. Once again, if you have never gone camping before, I am going to recommend going without your dog for the first few times. Still make sure that wherever you go is dog-friendly, so that you can scout out the land before you bring your canine companion. Believe me, your dog will be super impressed if you already know which are the best trees to pee on. So, now you are ready to bring your pup along. Fun fun fun. I’m just gonna go ahead and give you all the advice that I have, so get ready! Now by this point you are a seasoned camper and you know camping involves a whole lot of gear. Bringing your dog along means that you are going to have bring a little bit more gear along. But don’t worry, because I am going to help you pack and tell you what you should be bringing for your furry friend. First and foremost, make sure to bring both a first aid kit for you and your dog. You never ever want to venture out into the great outdoors without it. If you have any questions about what to put in the first aid kit for your pup then I am sure that Rochelle would be more than happy to help you out. A very important item is a steel cable tie-out line. A ten foot line will do the job. This is essential. In the woods, things are kinda unpredictable. 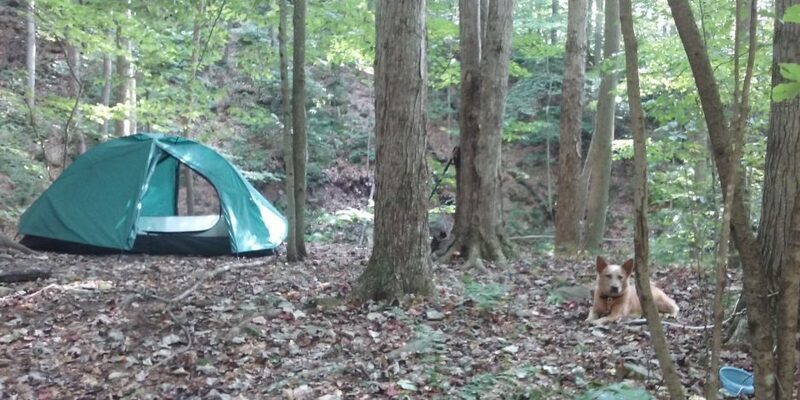 You never know when a critter might come waltzing through your campsite. You definitely don’t want your pup to start chasing after it and get lost in the woods. Sometimes you might have to go somewhere and it wouldn’t be a good idea for your pup to come along. Or maybe you just want to keep your pup out of trouble while you’re cooking up dinner. I can’t stress it’s importance enough, so don’t forget it! Another super important piece of gear is your dog’s sleep system. Now you might be thinking, “Cmon Dan, Fido here is a direct descendant of the mighty wolf. He can sleep right on the ground just like his ancestors have been doing for thousands of years!” Now I hate to rain on you parade, but I have yet to meet a dog who can get a good night’s rest on the cold ground. I think a little anecdote about my own dog might be appropriate here. The first time that I took my dog camping, I thought that she would be fine to just curl up in a ball and sleep anywhere. Well, I was wrong. 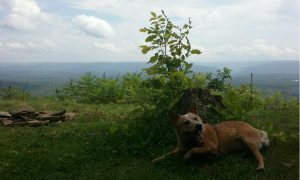 During the day we had done a good bit of hiking and both of us were pretty tired out. While I was making supper she was getting some nap time in on my sleeping pad. I was pretty fine with that. The only problem was that when it was time for bed, she figured that the sleeping pad was now hers and that I should get my own. After some compromisin’ we decided that we could share the sleeping pad. This definitely wasn’t as comfortable as if she had her own though. Lesson learned. The next time we ventured out into the woods my pup had her very own sleeping pad. Believe me, when you’re out camping, you want yourself a well-rested pup because a well-rested pup is a happy pup. That’s a fact, Jack! 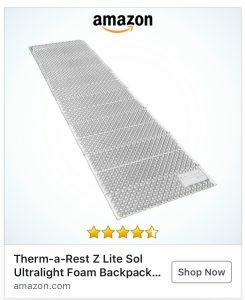 If you want a good-quality piece of equipment at an affordable price, then the Therm-a-Rest Z Lite Sol Ultralight Foam Backpacking Mattress is what you want. Go for the small size (which will be plenty big for your dog) and it'll still only come out to $35. Not too bad, I'd say. 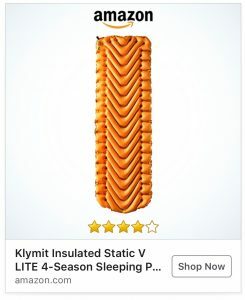 Now if you are looking for something a bit more compact, then I think that Klymit sleeping pad is a good buy. 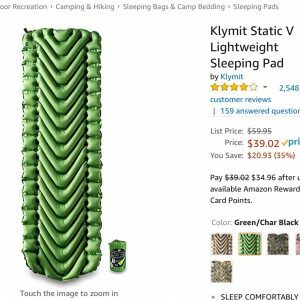 If you plan on going camping in colder weather then they sell an insulated version as well. I tried a few trips with my dog with just the pad and she kept trying to fluff it like she would a blanket. After a few failed attempts, she would come on over to my sleeping pad and plop herself right on down on my sleeping bag. Guess I shoulda seen that one coming. Next trip I put a blanket on top of her sleeping pad and she was finally content. Mission accomplished! 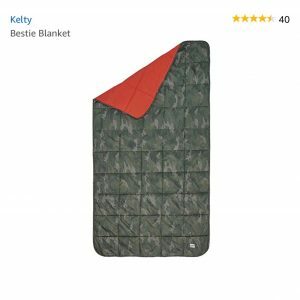 If you are looking for an affordable, durable, and lightweight blanket then the Kelty Bestie is your best bet. 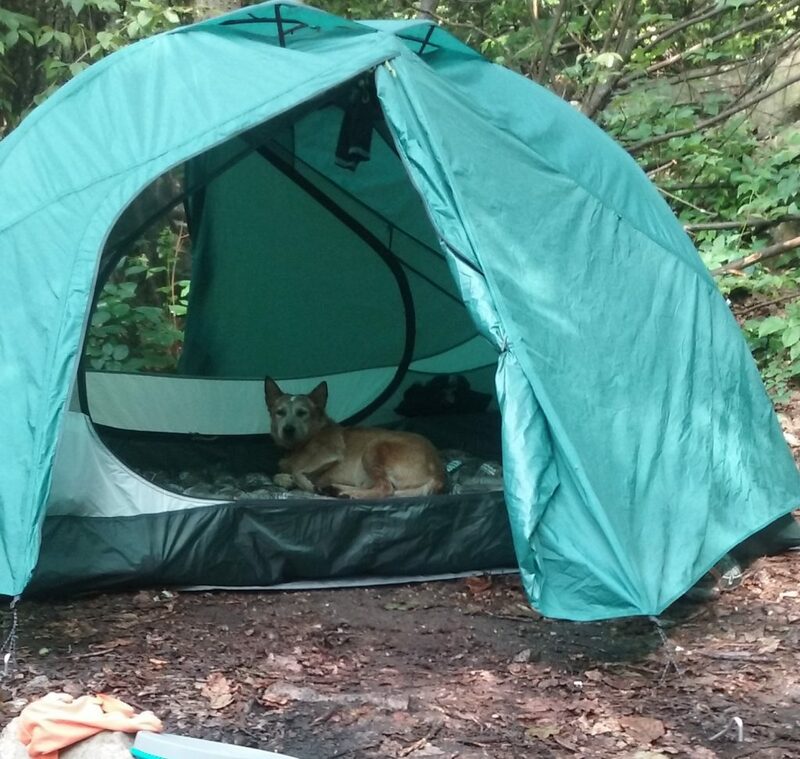 One solid piece of nighttime advice for while you and your doggy dog are cozied up in your tent is this: MAKE SURE YOUR DOG STAYS IN THE TENT. You definitely don't want your dog wandering out in the dark. Your curious friend might get lost or might try to make friends with a critter. Nighttime is the one time that it is very very important to keep your dog from roaming. If your dog is insistent on going out in the middle of the night, then you had best go with and bring the leash. Another topic that needs adressin' is the whole food situation. Make sure to bring enough kibble to keep a happy pup! My pup and I do a good bit of hiking when we go camping so I feed her double her usual amount of food. If you plan on doing lots of activities with your dog during the day, then that is a good amount. In fact, even if you are just relaxing during the day, then bring double anyways. Oh, and don't forget the food bowl! And bring lots of treats! You don't want any pooches going hungry! Well I reckon that just about is all I got for you. I hope that by now you are just dying to go out in them woods with your buddy and get in some high quality bonding time with Mother Nature! Now remember, the most important thing is to have fun. If you are able to do that, then I'd say that my work here is done! It has truly been a pleasure. Happy trails and tails my fellow adventurer!